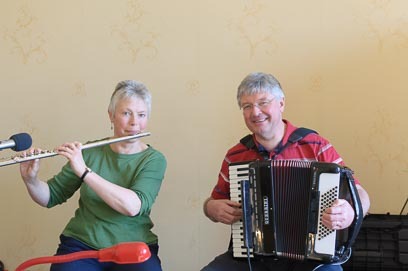 Roger Wilkins and Maggie Percy — Accordion and Flute for English, Welsh and Scottish Folk Dancing. Based in Bromyard, Herefordshire, The Falconers English Folk Dance Band was formed in 1975, initially to play for the fortnightly folk dance club that still meets in the town, but quickly playing to a wider audience, especially after appearances at the Sidmouth and other Folk Festivals, where an ability to 'have a go' at anything in the broad folk-dance repertoire made them much in demand. The band is now usually a duo, with Roger Wilkins — founder — on accordion, and Maggie Percy on flute and whistle. Roger and Maggie have played together virtually from the inception of the band in 1975, and are the regular line-up for outside bookings. Both having other commitments, they find it difficult to do more than around 12 to 15 bookings a year, usually including a festival or two; in 2017 their commitments include Chippenham, Whitby and Bromyard festivals. Not playing every week probably explains why they still enjoy playing after so many years. The band has never pretended to consist of the most technically proficient musicians in the world, but no-one tries harder to give dancers the "lift" which is so important. Whether that succeeds or not is for the dancers to judge! The band is happy to play anything in the broad Anglo-American repertoire, including Playford, Contra, Patter, Singing Square, English Traditional, Welsh and, on an occasional basis, Scottish. Roger continues to provide the resident music for the Falconers Folk Dance Club, often with Ian Wrenn on fiddle for part of the evening (he loves dancing too — as do all the musicians listed here — an essential pre-requisite for a good dance musician) and, when he is around on a visit home, Roger's son David on piano. He occasionally joins Roger and Maggie on outside events. Previous flautist Anna Beddows is taking a break — she played with Roger on and off for nearly twenty-five years, but has big family commitments, with three young children. Playford Style — L.P. — Private Label — sold out. Haphazard — Dances from Again, Let's Be Merry — L.P. — available from the band. All of the CDM 7 tracks are on the new EFDSS 4-CD Community Dances set — visit The EFDSS Folkshop for more details.